A Patent is an exclusive right granted by the government to an inventor in exchange of the disclosure of his invention to the world for a limited period of time. The patent protection grants a right of excluding others, from making, using, selling, importing the patented product or process for producing that product for those purposes without his consent. The Indian patent system evolved from the British patent law and the first patent Act was in enacted in the 1911 in the form of Indian Patent and Design Act. After independence of India, a need for the alterations and modification was felt in the Act; so the Government of India appointed Justice N. Rajagopala Ayyangar to examine and review patent law and the changes and recommendations took a shape of the Indian Patent Act, 1970 along with the Patent Rules, 1972. In 1995 India became a signatory in the TRIPS agreement and took the option to change the patent law in compliance with TRIPS thus opting for the grace period of ten years. The amendments were made in 1999 for accepting the product patents from 1995 and to provide exclusive marketing rights in India for a period of five years or till grant of product patents of other WTO member countries. The Patent (amendment) Act 2005 came into force from 1st January 2005, which brought a huge change in the previous patent system of India. The product patents were now granted to all fields of technology including food, drugs, chemicals and micro organisms; the provision for compulsory license for export of medicines; provisions for pre-grant and post-grant opposition of the grant of a patent; and increased national security provisions. Section 3(p) An invention which, in effect is traditional knowledge or which is an aggregation or duplication of known properties of traditionally known component or components. Section 4 No patent shall be granted in respect of an invention relating to atomic energy falling within sub-section (1) of section 20 of the Atomic Energy Act, 1962 (33 of 1962). Q.1 What is a Patent? A Patent is a exclusive right for an invention granted for a limited period of time of 20 years to the patentee, by the Government in exchange of full disclosure of his invention and for excluding others from making, using, selling, offering to sell, importing the patented invention without his/ her consent. Q.2 What is the need for a patent? A patent protection gives a patentee an exclusive right over the protected invention for making, using, selling, importing the patented invention. This right also excludes any other person from making, using, selling, offering to sell, importing the patented invention without the consent of the patentee. The patentee can license or sell his/her invention to someone else. Q.3 What can be patented? An invention relating either to a product or process that is new, involving inventive step and capable of industrial application can be patented. It also must not fall into the categories of inventions that are non-patentable under section 3 and 4 of the Indian Patent Act. Q.4 Who can apply for a patent? Q.5 What are the criteria of patentability? Q.6 What is an invention? Q.7 What is an inventive step and industrial application? Section 2(1)(ja) of the Indian Patent Act defines ”Inventive step” as a feature of an invention that involves technical advance as compared to the existing knowledge or having economic significance or both and that makes the invention not obvious to a person skilled in the art. While section 2(1)(ac) of the Indian Patent Act defines “Industrial application” means that the invention is capable of being made or used in an industry. Q.8 Is it necessary to provide an address of service for all the Foreign applicants? Yes. An applicant who is not a resident of India must give an address for service in India for filing a patent application. Q.9 Is second use of a known substance patentable in India? No. The second use of any known substance is not patentable in India. Any use itself is not patentable under Indian Patent Law u/s 2(1)(j). Q.10 Is software patentable in India? No. Software itself is not patentable under the Indian Patent Office under section 3(l). Q.11 What is the term of patent? 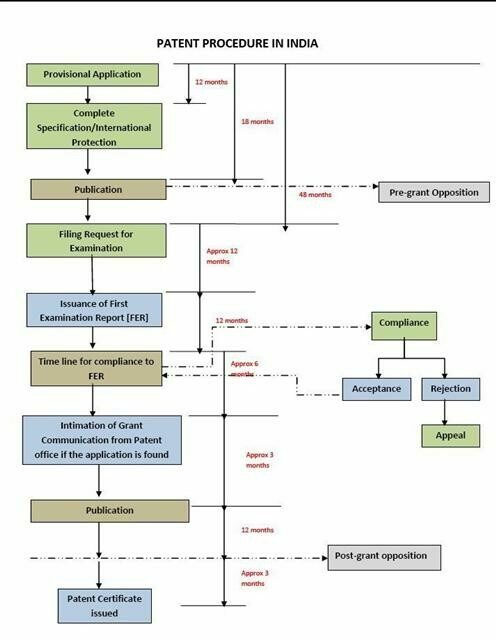 Term of every patent in India is 20 years from the date of filing of patent application or the priority date, irrespective of whether it is filed with provisional or complete specification; and in the case of applications filed under PCT the term of 20 years begins from International filing date. Q.12 Is it essential to deposit biological material in the international depository authority? If the invention uses a biological material which is new, it is essential to deposit the same in the International Depository Authority (IDA) prior to the filing of the application in India in order to supplement the description. The description in the specification should contain the name and address of the International Depository Authority and, date and number of deposition of Biological material. If such biological material is already known, in such case it is not essential to deposit the same. Q.13. Is there any International Depository Authority in India? Yes, there is an International Depository Authority in India located at Chandigarh which is known as Institute of Microbial Technology (IMTECH).